Not to be confused with anthocyanidins, the sugar-free counterparts of anthocyanins. Anthocyanins (also anthocyans; from Greek: ἄνθος (anthos) "flower" and κυάνεος/κυανοῦς kyaneos/kyanous "dark blue") are water-soluble vacuolar pigments that, depending on their pH, may appear red, purple, blue or black. Food plants rich in anthocyanins include the blueberry, raspberry, black rice, and black soybean, among many others that are red, blue, purple, or black. Some of the colors of autumn leaves are derived from anthocyanins. Anthocyanins belong to a parent class of molecules called flavonoids synthesized via the phenylpropanoid pathway. They occur in all tissues of higher plants, including leaves, stems, roots, flowers, and fruits. Anthocyanins are derived from anthocyanidins by adding sugars. They are odorless and moderately astringent. Although approved to color foods and beverages in the European Union, anthocyanins are not approved for use as a food additive because they have not been verified as safe when used as food or supplement ingredients. There is no conclusive evidence that anthocyanins have any effect on human biology or diseases. In flowers, the coloration that is provided by anthocyanin accumulation may attract a wide variety of animal pollinators, while in fruits, the same coloration may aid in seed dispersal by attracting herbivorous animals to the potentially-edible fruits bearing these red, blue, or purple colors. Anthocyanins may have a protective role in plants against extreme temperatures. Tomato plants protect against cold stress with anthocyanins countering reactive oxygen species, leading to a lower rate of cell death in leaves. The absorbance pattern responsible for the red color of anthocyanins may be complementary to that of green chlorophyll in photosynthetically-active tissues such as young Quercus coccifera leaves. It may protect the leaves from attacks by herbivores that may be attracted by green color. Anthocyanins are found in the cell vacuole, mostly in flowers and fruits, but also in leaves, stems, and roots. In these parts, they are found predominantly in outer cell layers such as the epidermis and peripheral mesophyll cells. Most frequently occurring in nature are the glycosides of cyanidin, delphinidin, malvidin, pelargonidin, peonidin, and petunidin. Roughly 2% of all hydrocarbons fixed in photosynthesis are converted into flavonoids and their derivatives, such as the anthocyanins. Not all land plants contain anthocyanin; in the Caryophyllales (including cactus, beets, and amaranth), they are replaced by betalains. Anthocyanins and betalains have never been found in the same plant. Sometimes bred purposely for high anthocyanin quantities, ornamental plants such as sweet peppers may have unusual culinary and aesthetic appeal. Anthocyanins occur in the flowers of many plants, such as the blue poppies of some Meconopsis species and cultivars. Plants rich in anthocyanins are Vaccinium species, such as blueberry, cranberry, and bilberry; Rubus berries, including black raspberry, red raspberry, and blackberry; blackcurrant, cherry, eggplant (aubergine) peel, black rice, ube, Okinawan sweet potato, Concord grape, muscadine grape, red cabbage, and violet petals. Red-fleshed peaches and apples contain anthocyanins. Anthocyanins are less abundant in banana, asparagus, pea, fennel, pear, and potato, and may be totally absent in certain cultivars of green gooseberries. The highest recorded amount appears to be specifically in the seed coat of black soybean (Glycine max L. Merr.) containing approximately 2 g per 100 g, in purple corn kernels and husks, and in the skins and pulp of black chokeberry (Aronia melanocarpa L.) (see table). Due to critical differences in sample origin, preparation, and extraction methods determining anthocyanin content, the values presented in the adjoining table are not directly comparable. 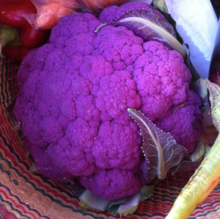 Nature, traditional agriculture methods, and plant breeding have produced various uncommon crops containing anthocyanins, including blue- or red-flesh potatoes and purple or red broccoli, cabbage, cauliflower, carrots, and corn. Garden tomatoes have been subjected to a breeding program using introgression lines of genetically modified organisms (but not incorporating them in the final purple tomato) to define the genetic basis of purple coloration in wild species that originally were from Chile and the Galapagos Islands. The variety known as "Indigo Rose" became available commercially to the agricultural industry and home gardeners in 2012. Investing tomatoes with high anthocyanin content doubles their shelf-life and inhibits growth of a post-harvest mold pathogen, Botrytis cinerea. Some tomatoes also have been modified genetically with transcription factors from snapdragons to produce high levels of anthocyanins in the fruits. Anthocyanins also may be found in naturally ripened olives, and are partly responsible for the red and purple colors of some olives. Content of anthocyanins in the leaves of colorful plant foods such as purple corn, blueberries, or lingonberries, is about ten times higher than in the edible kernels or fruit. The color spectrum of grape berry leaves may be analysed to evaluate the amount of anthocyanins. Fruit maturity, quality, and harvest time may be evaluated on the basis of the spectrum analysis. The reds, purples, and their blended combinations responsible for autumn foliage are derived from anthocyanins. Unlike carotenoids, anthocyanins are not present in the leaf throughout the growing season, but are produced actively, toward the end of summer. They develop in late summer in the sap of leaf cells, resulting from complex interactions of factors inside and outside the plant. Their formation depends on the breakdown of sugars in the presence of light as the level of phosphate in the leaf is reduced. Orange leaves in autumn result from a combination of anthocyanins and carotenoids. Anthocyanins are present in approximately 10% of tree species in temperate regions, although in certain areas such as New England, up to 70% of tree species may produce anthocyanins. Anthocyanins are approved for use as food colorants in the European Union, Australia, and New Zealand, having colorant code E163. In 2013, a panel of scientific experts for the European Food Safety Authority concluded that anthocyanins from various fruits and vegetables have been insufficiently characterized by safety and toxicology studies to approve their use as food additives. Extending from a safe history of using red grape skin extract and blackcurrant extracts to color foods produced in Europe, the panel concluded that these extract sources were exceptions to the ruling and were sufficiently shown to be safe. Anthocyanin extracts are not specifically listed among approved color additives for foods in the United States; however, grape juice, red grape skin and many fruit and vegetable juices, which are approved for use as colorants, are rich in naturally occurring anthocyanins. No anthocyanin sources are included among approved colorants for drugs or cosmetics. Although anthocyanins have been shown to have antioxidant properties in vitro, there is no evidence for anthocyanin antioxidant effects in the body after the plant is consumed. Unlike controlled test-tube conditions, the fate of anthocyanins in vivo shows they are poorly-conserved (less than 5%), with most of what is absorbed existing as chemically-modified metabolites that are excreted rapidly. The increase in antioxidant capacity of blood seen after the consumption of anthocyanin-rich foods may not be caused directly by the anthocyanins in the food, but instead, may result from increased uric acid levels derived from the metabolism of the flavonoids in the food. It is possible that catabolites of ingested anthocyanins are reabsorbed in the gastrointestinal tract from where they may enter the blood for systemic distribution to have biological effects. As of 2019[update], there are no substantial clinical trials indicating that dietary anthocyanins lower the risk against any human diseases. The anthocyanins, anthocyanidins with sugar group(s), are mostly 3-glucosides of the anthocyanidins. The anthocyanins are subdivided into the sugar-free anthocyanidin aglycones and the anthocyanin glycosides. As of 2003, more than 400 anthocyanins had been reported, while later literature in early 2006, puts the number at more than 550 different anthocyanins. The difference in chemical structure that occurs in response to changes in pH, is the reason why anthocyanins often are used as pH indicators, as they change from red in acids to blue in bases. Anthocyanins are thought to be subject to physiochemical degradation in vivo and in vitro. Structure, pH, temperature, light, oxygen, metal ions, intramolecular association, and intermolecular association with other compounds (copigments, sugars, proteins, degradation products, etc.) 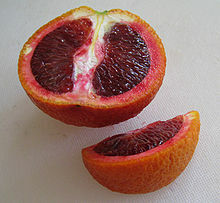 generally are known to affect the color and stability of anthocyanins. B-ring hydroxylation status and pH have been shown to mediate the degradation of anthocyanins to their phenolic acid and aldehyde constituents. Indeed, significant portions of ingested anthocyanins are likely to degrade to phenolic acids and aldehyde in vivo, following consumption. This characteristic confounds scientific isolation of specific anthocyanin mechanisms in vivo. Anthocyanins generally are degraded at higher pH. 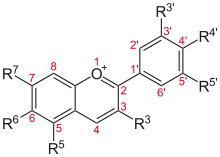 However, some anthocyanins, such as petanin (petunidin 3-[6-O-(4-O-(E)-p-coumaroyl-O-α-L-rhamnopyranosyl)-β-D-glucopyranoside]-5-O-β-D-glucopyranoside), are resistant to degradation at pH 8 and may be used effectively as a food colorant. Anthocyanins may be used as pH indicators because their color changes with pH; they are red or pink in acidic solutions (pH < 7), purple in neutral solutions (pH ~ 7), greenish-yellow in alkaline solutions (pH > 7), and colorless in very alkaline solutions, where the pigment is completely reduced. The resulting unstable anthocyanidins are further coupled to sugar molecules by enzymes such as UDP-3-O-glucosyltransferase, to yield the final relatively-stable anthocyanins. Thus, more than five enzymes are required to synthesize these pigments, each working in concert. Even a minor disruption in any of the mechanisms of these enzymes by either genetic or environmental factors, would halt anthocyanin production. While the biological burden of producing anthocyanins is relatively high, plants benefit significantly from the environmental adaptation, disease tolerance, and pest tolerance provided by anthocyanins. In anthocyanin biosynthetic pathway, L-phenylalanine is converted to naringenin by phenylalanine ammonialyase (PAL), cinnamate 4-hydroxylase (C4H), 4-coumarate CoA ligase (4CL), chalcone synthase (CHS), and chalcone isomerase (CHI). Then, the next pathway is catalyzed, resulting in the formation of complex aglycone and anthocyanin through composition by flavanone 3-hydroxylase (F3H), flavonoid 3'-hydroxylase (F3'H), dihydroflavonol 4-reductase (DFR), anthocyanidin synthase (ANS), UDP-glucoside: flavonoid glucosyltransferase (UFGT), and methyl transferase (MT). Among those, UFGT is divided into UF3GT and UF5GT, which are responsible for the glucosylation of anthocyanin to produce stable molecules. In Arabidopsis thaliana, two glycosyltransferases, UGT79B1 and UGT84A2, are involved in the anthocyanin biosynthetic pathway. The UGT79B1 protein converts cyanidin 3-O-glucoside to cyanidin 3-O-xylosyl(1→2)glucoside. UGT84A2 encodes sinapic acid: UDP-glucosyltransferase. The phenolic metabolic pathways and enzymes may be studied by mean of transgenesis of genes. The Arabidopsis regulatory gene in the production of anthocyanin pigment 1 (AtPAP1) may be expressed in other plant species. Anthocyanins have been used in organic solar cells because of their ability to convert light energy into electrical energy. The many benefits to using dye-sensitized solar cells instead of traditional p-n junction silicon cells, include lower purity requirements and abundance of component materials, as well as the fact that they may be produced on flexible substrates, making them amenable to roll-to-roll printing processes. Anthocyanins fluoresce, enabling a tool for plant cell research to allow live cell imaging without a requirement for other fluorophores. Anthocyanin production may be engineered into genetically-modified materials to enable their identification visually. ^ a b Davies, Kevin M. (2004). Plant pigments and their manipulation. Wiley-Blackwell. p. 6. ISBN 978-1-4051-1737-1. ^ a b c Archetti, Marco; Döring, Thomas F.; Hagen, Snorre B.; et al. (2011). "Unravelling the evolution of autumn colours: an interdisciplinary approach". Trends in Ecology & Evolution. 24 (3): 166–73. doi:10.1016/j.tree.2008.10.006. PMID 19178979. ^ Andersen, Øyvind M (17 October 2001). "Anthocyanins". Encyclopedia of Life Sciences. eLS. John Wiley & Sons, Ltd. doi:10.1038/npg.els.0001909. ISBN 978-0470016176. ^ a b c d European Food Safety Authority (April 2013). "Scientific opinion on the re-evaluation of anthocyanins (E 163) as a food additive". EFSA Journal. 11 (4): 3145. doi:10.2903/j.efsa.2013.3145. ^ a b "Flavonoids: Disease prevention". Micronutrient Information Center. Corvallis, Oregon: Linus Pauling Institute, Oregon State University. 2016. ^ a b Qiu, Zhengkun; Wang, Xiaoxuan; Gao, Jianchang; Guo, Yanmei; Huang, Zejun; Du, Yongchen (4 March 2016). "The Tomato Hoffman's Anthocyaninless Gene Encodes a bHLH Transcription Factor Involved in Anthocyanin Biosynthesis That Is Developmentally Regulated and Induced by Low Temperatures". PLOS ONE. 11 (3): e0151067. Bibcode:2016PLoSO..1151067Q. doi:10.1371/journal.pone.0151067. ISSN 1932-6203. PMC 4778906. PMID 26943362. ^ Breusegem, Frank Van; Dat, James F. (1 June 2006). "Reactive Oxygen Species in Plant Cell Death". Plant Physiology. 141 (2): 384–390. doi:10.1104/pp.106.078295. ISSN 1532-2548. PMC 1475453. PMID 16760492. ^ Karageorgou P; Manetas Y (2006). "The importance of being red when young: anthocyanins and the protection of young leaves of Quercus coccifera from insect herbivory and excess light". Tree Physiol. 26 (5): 613–621. doi:10.1093/treephys/26.5.613. PMID 16452075. ^ Francis, F.J. (1999). Colorants. Egan Press. ISBN 978-1-891127-00-7. ^ Stafford, Helen A. (1994). "Anthocyanins and betalains: evolution of the mutually exclusive pathways". Plant Science. 101 (2): 91–98. doi:10.1016/0168-9452(94)90244-5. ^ Stommel J, Griesbach RJ (September 2006). "Twice as Nice Breeding Versatile Vegetables". Agricultural Research Magazine, US Department of Agriculture. Retrieved 2 February 2016. ^ "Colour range within genus". Meconopsis Group. Retrieved 30 June 2018. ^ a b Wu X; Gu L; Prior RL; et al. (December 2004). "Characterization of anthocyanins and proanthocyanidins in some cultivars of Ribes, Aronia, and Sambucus and their antioxidant capacity". Journal of Agricultural and Food Chemistry. 52 (26): 7846–56. doi:10.1021/jf0486850. PMID 15612766. ^ Siriwoharn T; Wrolstad RE; Finn CE; et al. (December 2004). "Influence of cultivar, maturity, and sampling on blackberry (Rubus L. Hybrids) anthocyanins, polyphenolics, and antioxidant properties". Journal of Agricultural and Food Chemistry. 52 (26): 8021–30. doi:10.1021/jf048619y. PMID 15612791. ^ Wada L; Ou B (June 2002). "Antioxidant activity and phenolic content of Oregon caneberries". Journal of Agricultural and Food Chemistry. 50 (12): 3495–500. doi:10.1021/jf011405l. PMID 12033817. ^ Hosseinian FS; Beta T (December 2007). "Saskatoon and wild blueberries have higher anthocyanin contents than other Manitoba berries". Journal of Agricultural and Food Chemistry. 55 (26): 10832–8. doi:10.1021/jf072529m. PMID 18052240. ^ Wu X; Beecher GR; Holden JM; et al. (November 2006). "Concentrations of anthocyanins in common foods in the United States and estimation of normal consumption". Journal of Agricultural and Food Chemistry. 54 (11): 4069–75. doi:10.1021/jf060300l. PMID 16719536. ^ Fanning K; Edwards D; Netzel M; et al. (November 2013). "Increasing anthocyanin content in Queen Garnet plum and correlations with in-field measures". Acta Horticulturae. 985: 97–104. ^ Lieberman S (2007). "The antioxidant power of purple corn: a research review". Alternative & Complementary Therapies. 13 (2): 107–110. doi:10.1089/act.2007.13210. ^ a b Li, C. Y.; Kim, H. W.; Won, S. R.; et al. (2008). "Corn husk as a potential source of anthocyanins". Journal of Agricultural and Food Chemistry. 56 (23): 11413–6. doi:10.1021/jf802201c. PMID 19007127. ^ a b Muñoz-Espada, A. C.; Wood, K. V.; Bordelon, B.; et al. (2004). "Anthocyanin Quantification and Radical Scavenging Capacity of Concord, Norton, and Marechal Foch Grapes and Wines". Journal of Agricultural and Food Chemistry. 52 (22): 6779–86. doi:10.1021/jf040087y. PMID 15506816. ^ a b Ahmadiani, Neda; Robbins, Rebecca J.; Collins, Thomas M.; et al. (2014). "Anthocyanins Contents, Profiles, and Color Characteristics of Red Cabbage Extracts from Different Cultivars and Maturity Stages". Journal of Agricultural and Food Chemistry. 62 (30): 7524–31. doi:10.1021/jf501991q. PMID 24991694. ^ Tamaroh, Siti; Raharjo, Sri; Murdiati, Agnes; Anggrahini, Sri (1 June 2018). "Total Phenolic Content and Antioxidant Activity of Anthocyanin Extract from Purple Yam (Dioscorea alata L.) Flour Using Different Solvents". Pakistan Journal of Nutrition. 17 (6): 260–267. doi:10.3923/pjn.2018.260.267. ^ Cevallos-Casals, BA; Byrne, D; Okie, WR; et al. (2006). "Selecting new peach and plum genotypes rich in phenolic compounds and enhanced functional properties". Food Chemistry. 96 (2): 273–328. doi:10.1016/j.foodchem.2005.02.032. ^ Sekido, Keiko; et al. (2010). "Efficient breeding system for red-fleshed apple based on linkage with S3-RNase allele in 'Pink Pearl'". HortScience. 45 (4): 534–537. doi:10.21273/HORTSCI.45.4.534. ^ Oki, Tomoyuki; Kano, Mitsuyoshi; Watanabe, Osamu; Goto, Kazuhisa; Boelsma, Esther; Ishikawa, Fumiyasu; Suda, Ikuo (2016). "Effect of consuming a purple-fleshed sweet potato beverage on health-related biomarkers and safety parameters in Caucasian subjects with elevated levels of blood pressure and liver function biomarkers: a 4-week, open-label, non-comparative trial". Bioscience of Microbiota, Food and Health. 35 (3): 129–136. doi:10.12938/bmfh.2015-026. PMC 4965517. PMID 27508114. ^ Moriya, Chiemi; Hosoya, Takahiro; Agawa, Sayuri; Sugiyama, Yasumasa; Kozone, Ikuko; Shin-ya, Kazuo; Terahara, Norihiko; Kumazawa, Shigenori (7 April 2015). "New acylated anthocyanins from purple yam and their antioxidant activity". Bioscience, Biotechnology, and Biochemistry. 79 (9): 1484–1492. doi:10.1080/09168451.2015.1027652. PMID 25848974. ^ Choung, Myoung-Gun; Baek, In-Youl; Kang, Sung-Taeg; et al. (December 2001). "Isolation and determination of anthocyanins in seed coats of black soybean (Glycine max (L.) Merr.)". J. Agric. Food Chem. 49 (12): 5848–51. doi:10.1021/jf010550w. PMID 11743773. ^ Krenn, L; Steitz, M; Schlicht, C; et al. (November 2007). "Anthocyanin- and proanthocyanidin-rich extracts of berries in food supplements—analysis with problems". Pharmazie. 62 (11): 803–12. PMID 18065095. ^ Siriwoharn, T; Wrolstad, RE; Finn, CE; et al. (December 2004). "Influence of cultivar, maturity, and sampling on blackberry (Rubus L. Hybrids) anthocyanins, polyphenolics, and antioxidant properties". J Agric Food Chem. 52 (26): 8021–30. doi:10.1021/jf048619y. PMID 15612791. ^ a b Scott J (27 January 2012). 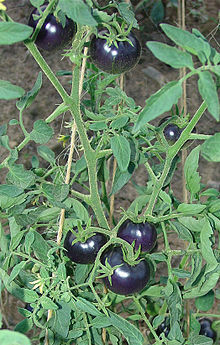 "Purple tomato debuts as 'Indigo Rose'". Oregon State University Extension Service, Corvallis. Retrieved 9 September 2014. ^ Zhang, Y.; Butelli, E.; De Stefano, R.; et al. (2013). "Anthocyanins Double the Shelf Life of Tomatoes by Delaying Overripening and Reducing Susceptibility to Gray Mold". Current Biology. 23 (12): 1094–100. doi:10.1016/j.cub.2013.04.072. PMC 3688073. PMID 23707429. ^ Butelli, Eugenio; Titta, Lucilla; Giorgio, Marco; et al. (November 2008). "Enrichment of tomato fruit with health-promoting anthocyanins by expression of select transcription factors". Nature Biotechnology. 26 (11): 1301–8. doi:10.1038/nbt.1506. PMID 18953354. ^ a b Agati, Giovanni; Pinelli, Patrizia; Cortés Ebner, Solange; et al. (March 2005). "Nondestructive evaluation of anthocyanins in olive (Olea europaea) fruits by in situ chlorophyll fluorescence spectroscopy". Journal of Agricultural and Food Chemistry. 53 (5): 1354–63. doi:10.1021/jf048381d. PMID 15740006. ^ Stan Kailis & David Harris (28 February 2007). "The olive tree Olea europaea". Producing Table Olives. Landlinks Press. pp. 17–66. ISBN 978-0-643-09203-7. ^ Vyas, P; Kalidindi, S; Chibrikova, L; et al. (2013). "Chemical analysis and effect of blueberry and lingonberry fruits and leaves against glutamate-mediated excitotoxicity". Journal of Agricultural and Food Chemistry. 61 (32): 7769–76. doi:10.1021/jf401158a. PMID 23875756. ^ Bramley, R.G.V. ; Le Moigne, M.; Evain, S.; et al. (February 2011). "On-the-go sensing of grape berry anthocyanins during commercial harvest: development and prospects" (PDF). Australian Journal of Grape and Wine Research. 17 (3): 316–326. doi:10.1111/j.1755-0238.2011.00158.x. ^ a b c "The Process of Leaf Color Change". Petersham, MA: Harvard Forest, Harvard University. 2011. Retrieved 10 April 2017. ^ "Current EU approved additives and their E Numbers". United Kingdom: Food Standards Agency. 2010. Retrieved 12 August 2017. ^ Australia New Zealand Food Standards Code "Standard 1.2.4 — Labelling of ingredients". Retrieved 27 October 2011. ^ "Summary of Color Additives for Use in the United States in Foods, Drugs, Cosmetics, and Medical Devices". US Food and Drug Administration. May 2015. Retrieved 29 June 2017. ^ "Summary of Color Additives for Use in the United States in Foods, Drugs, Cosmetics, and Medical Devices". US Food and Drug Administration. May 2015. Retrieved 13 August 2017. ^ De Rosso, VV; Morán Vieyra, FE; Mercadante, AZ; et al. (October 2008). "Singlet oxygen quenching by anthocyanin's flavylium cations". Free Radical Research. 42 (10): 885–91. doi:10.1080/10715760802506349. PMID 18985487. ^ Lotito SB; Frei B (2006). "Consumption of flavonoid-rich foods and increased plasma antioxidant capacity in humans: cause, consequence, or epiphenomenon?". Free Radic. Biol. Med. 41 (12): 1727–46. doi:10.1016/j.freeradbiomed.2006.04.033. PMID 17157175. ^ Williams RJ; Spencer JP; Rice-Evans C (April 2004). "Flavonoids: antioxidants or signalling molecules?". Free Radical Biology & Medicine. 36 (7): 838–49. doi:10.1016/j.freeradbiomed.2004.01.001. PMID 15019969. ^ Kay, C. D.; Pereira-Caro, G; Ludwig, I. A.; et al. (2017). "Anthocyanins and Flavanones Are More Bioavailable than Previously Perceived: A Review of Recent Evidence". Annual Review of Food Science and Technology. 8: 155–180. doi:10.1146/annurev-food-030216-025636. PMID 28125348. ^ Kong, JM; Chia, LS; Goh, NK; et al. (November 2003). "Analysis and biological activities of anthocyanins". Phytochemistry. 64 (5): 923–33. doi:10.1016/S0031-9422(03)00438-2. PMID 14561507. ^ Andersen, Øyvind M.; Jordheim, Monica (2008). "Anthocyanins- food applications". 5th Pigments in Food congress- for quality and health. University of Helsinki. ISBN 978-952-10-4846-3. ^ Woodward, G; Kroon, P; Cassidy, A; et al. (June 2009). "Anthocyanin stability and recovery: implications for the analysis of clinical and experimental samples". J. Agric. Food Chem. 57 (12): 5271–8. doi:10.1021/jf900602b. PMID 19435353. ^ Fossen T; Cabrita L; Andersen OM (December 1998). "Colour and stability of pure anthocyanins influenced by pH including the alkaline region". Food Chemistry. 63 (4): 435–440. doi:10.1016/S0308-8146(98)00065-X. hdl:10198/3206. ^ Michaelis, Leonor; Schubert, M.P. ; Smythe, C.V. (1 December 1936). "Potentiometric Study of the Flavins". J. Biol. Chem. 116 (2): 587–607. ^ Jack Sullivan (1998). "Anthocyanin". Carnivorous Plant Newsletter. Archived from the original on 1 November 2009. Retrieved 6 October 2009. ^ Nakajima, J; Tanaka, Y; Yamazaki, M; et al. (July 2001). "Reaction mechanism from leucoanthocyanidin to anthocyanidin 3-glucoside, a key reaction for coloring in anthocyanin biosynthesis". The Journal of Biological Chemistry. 276 (28): 25797–803. doi:10.1074/jbc.M100744200. PMID 11316805. ^ Kovinich, N; Saleem, A; Arnason, JT; et al. (August 2010). "Functional characterization of a UDP-glucose:flavonoid 3-O-glucosyltransferase from the seed coat of black soybean (Glycine max (L.) Merr.)". Phytochemistry. 71 (11–12): 1253–63. doi:10.1016/j.phytochem.2010.05.009. PMID 20621794. ^ Da Qiu Zhao; Chen Xia Han; Jin Tao Ge; et al. (15 November 2012). "Isolation of a UDP-glucose: Flavonoid 5-O-glucosyltransferase gene and expression analysis of anthocyanin biosynthetic genes in herbaceous peony (Paeonia lactiflora Pall.)". Electronic Journal of Biotechnology. 15 (6). doi:10.2225/vol15-issue6-fulltext-7. ^ Yonekura-Sakakibara K; Fukushima A; Nakabayashi R; et al. (January 2012). "Two glycosyltransferases involved in anthocyanin modification delineated by transcriptome independent component analysis in Arabidopsis thaliana". Plant J. 69 (1): 154–67. doi:10.1111/j.1365-313X.2011.04779.x. PMC 3507004. PMID 21899608. ^ Li, Xiang; Gao, Ming-Jun; Pan, Hong-Yu; et al. (2010). "Purple canola: Arabidopsis PAP1 increases antioxidants and phenolics in Brassica napus leaves". J. Agric. Food Chem. 58 (3): 1639–1645. doi:10.1021/jf903527y. PMID 20073469. 2 Nanocrystalline Electrode" (PDF). The Journal of Physical Chemistry B. 101 (45): 9342–51. doi:10.1021/jp972197w. ^ Grätzel, Michael (October 2003). "Dye-sensitized solar cells". Journal of Photochemistry and Photobiology. 4 (2): 145–53. doi:10.1016/S1389-5567(03)00026-1. ^ Wiltshire EJ; Collings DA (October 2009). "New dynamics in an old friend: dynamic tubular vacuoles radiate through the cortical cytoplasm of red onion epidermal cells". Plant & Cell Physiology. 50 (10): 1826–39. doi:10.1093/pcp/pcp124. PMID 19762337. ^ Kovinich, N; Saleem, A; Rintoul, TL; et al. (August 2012). "Coloring genetically modified soybean grains with anthocyanins by suppression of the proanthocyanidin genes ANR1 and ANR2". Transgenic Res. 21 (4): 757–71. doi:10.1007/s11248-011-9566-y. PMID 22083247. Andersen, O.M. (2006). Flavonoids: Chemistry, Biochemistry and Applications. Boca Raton FL: CRC Press. ISBN 978-0-8493-2021-7. Gould, K.; Davies, K.; Winefield, C., eds. (2008). Anthocyanins: Biosynthesis, Functions, and Applications. Springer. ISBN 978-0-387-77334-6.